Library Who is on the Dime? It seems very appropriate that the founder of the March of Dimes is enshrined on the Dime. But, who exactly is he? You may know him better as President Franklin Delano Roosevelt, our nation’s 32nd president. Roosevelt has appeared on the Dime since 1946, the year after his death. Today, it seems, relatively few among the youngest generations know much about the man commonly referred to by his initials, FDR. However, the man who was famously quoted as saying, “the only thing we have to fear is fear itself” during his inaugural address at the depths of the Great Depression, is seen every day by anyone who holds a modern U.S. Dime in his or her hands. Who was Franklin Delano Roosevelt? Below is some more information about the president who guided us through the Great Depression and navigated a nation at war. Franklin Delano Roosevelt was born on January 30, 1882 in Hyde Park, New York. He attended Harvard University and Columbia Law School, and married Eleanor Roosevelt on St. Patrick’s Day 1905. Roosevelt would follow in the footsteps of his fifth cousin, Theodore Roosevelt, a public servant throughout his career who eventually served as our nation’s president from 1901 through 1909. Franklin Roosevelt became a New York senator in 1910, and President Woodrow Wilson appointed him as Assistant Secretary of the Navy. Roosevelt became the vice presidential nominee in 1920 running with Democrat James M. Cox, but the Cox-Roosevelt ticket lost against Republican Warren G. Harding, who died in 1923 and was automatically succeeded in the Oval Office by his vice president, Calvin Coolidge. During the summer of 1921, tragedy struck Roosevelt. At the age of 39, he was diagnosed with Polio. He fought the disease courageously, vowing to regain use of his legs through swimming. He appeared, on crutches, at the 1924 Democratic National Convention to nominate Alfred E. Smith as “the Happy Warrior.” Four years later, Roosevelt became the governor of New York. In late 1929, the bottom fell out from under the stock market and the nation quickly plunged into the Great Depression. Millions lost their jobs. Companies folded. The nation was reeling from economic disaster. At a point that many historians consider the very height of the Great Depression, Roosevelt was elected as our president in November 1932. By the start of 1933, more than 10 million Americans were unemployed and most banks had closed. To combat the vast unemployment, Roosevelt, in cooperation with Congress, established numerous programs under the New Deal to help revive our nation’s ailing economy; the country was also removed the country from the Gold Standard. One of these New Deal initiatives included the formation of the Tennessee Valley Authority, a federally owned entity that now provides flood control, navigation, electricity production, fertilizer manufacturing, and economic development throughout the Tennessee Valley. Other Public Works Administration programs would follow, which would lead to the construction of many now-famous structures and sites including Lincoln Tunnel in New York City, and Griffith Observatory in Los Angeles. With Germany’s invasion of Poland in 1939, Europe plunged into war. Roosevelt, under his “good neighbor” policy, sent aid to Britain in 1940 during the beginning of the war in Europe. After the attack on Pearl Harbor on December 7, 1941, the United States declared war on both Japan and Germany, and Roosevelt redirected our nation’s focus from economic reconstruction to winning World War II. As the war progressed, Roosevelt proposed the formation of what became the United Nations, which he envisioned as a diplomatic forum for preventing and solving international problems. Roosevelt, whose health deteriorated during the war, died of a cerebral hemorrhage on April 12, 1945 at his “Little White House” in Warm Springs, Georgia. 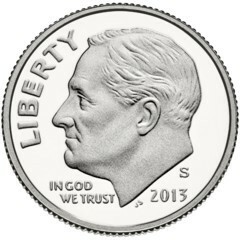 The Roosevelt Dime replaced the Mercury Dime and was released to the public on January 30, 1946, which would have been Roosevelt’s 64th birthday. Designed by John R. Sinnock, the Roosevelt Dime series features very few regular-issue pieces that could be considered rare. In fact, the Roosevelt Dime is a very affordable coin series for collectors on virtually any budget. Coin collectors on a shoestring budget may opt to collect the coin from circulation, saving their money to buy the more costly 90 percent silver Roosevelt Dimes, which were struck for circulation from 1946 through 1964. Those with greater financial resources may choose to collect only uncirculated and proof specimens of the Roosevelt Dime. No matter what method of collecting you prefer, a Roosevelt Dime collection would make a fine addition to any collection of United States collectible coins. For year-by-year details on the Roosevelt Dime, please visit our Roosevelt Dime Series page.